If you are attending Worldcon in Reno this week and have an interest in semiprozines, we are once again calling on your support. There are two business meetings that may very well reshape the boundaries of the Best Semiprozine Hugo Award. Quite often, people overlook the importance of the first business meeting, but this one is critical. It is at the Thursday morning meeting that the conflicting proposals and minority reports will be heard and resolved into a single proposal for vote on Friday. The committee report, discussed here, could be abandoned or rewritten before it even gets to a vote. In the his minority report to the Semiprozine Committee report, Ben Yalow, one of the key people behind the original proposal to eliminate the semiprozine category, has indicated that he will attempt to have his proposal added to the committee’s proposed rules. Ben would like to see any magazine that offers authors a “pro” rate eliminated from the category. His model would eliminate 13 of the 20 publications people nominated last year and many others that have appeared since. The committee originally rejected this amendment because it eliminated too many semiprozines from the category. At this time, the only markets it has an immediate impact on are fiction magazines. Other minority reports seek to have the whole proposal thrown out and leave the rules alone for another year. The committee proposal, if not perfect, is at least a step in the right direction. Given that approving a rules change takes two years, losing another year when progress can be made, is a bad idea. Passing the committee’s proposal would not prevent further corrections from being introduced next year, so why wait? According to Saul Jaffe, we should wait until we have an easily accessible definition for fans. If one existed, it would have been discovered by now. Personally, I don’t think it will take long for fans to adjust to any rules change. When certain people were saying “we don’t seem to have any nominees for this category apart from the five who get nominated each year” a simple campaign to educate voters worked effectively. It could easily be duplicated. Since the proposal we mentioned yesterday will also be on the table, there is a high probability that there will be an attempt to eliminate the conflicts between the two. The “Keep the Fanzine Hugo nonprofessional and limited to words on paper or video screen” proposal carelessly makes all professional magazines eligible for Best Semiprozine. I know that there are some people who feel very passionately about maintaining the print purity of fanzines (I’ve not heard this coming from semiprozine people), but even if you feel that way, you should prevent unnecessary damage to the semiprozine category, strike down this proposal and toss your support behind a the Best Fancast proposal. If you don’t support the concept of a separate category for podcasts, etc., then vote no on both. We need people there on THURSDAY to vote against any amendments that try to undermine the category by either stripping or adding large numbers of potential nominees from the current committee proposal. A majority vote is required to change the committee proposal. This is why it is important to have people there. Anyone and everyone attending the meeting gets a vote.Your vote counts. This will be the first vote on whatever proposal survives and comes out of Thursday’s meeting. If it passes, it will have to be voted on again in Chicago before becoming official. In short: Thursday is important to protect the committee proposal from being co-opted. Friday is important to either pass the original proposal or reject the modified form. Please attend if you can. If you can’t, tell someone who can. It seems that some fans disgruntled over the fact that podcasts can compete in fanzine or semiprozine have submitted their own proposal for modifications to the semiprozine and fanzine categories to kick them out. The semiprozine committee saw this proposal before completing theirs and specifically chose not to include it. (5) (4) announced itself to be a semiprozine. Audio and video productions are excluded from this category. The impact of this change would be to put EVERY magazine that isn’t a fanzine (or anything that doesn’t have “issues”, goodbye Daily Science Fiction?) INTO THE SEMIPROZINE CATEGORY. Yes, Asimov’s, Analog, F&SF… ALL of them would be eligible in the semiprozine category. Just ridiculous. Don’t let them throw semiprozines under the bus to maintain “print purity” in the fanzine and semiprozine categories! Go to the business meetings this THURSDAY and FRIDAY morning at Worldcon and make yourself heard. More details to follow. This blog has been silent for a while. It has been nearly two years since the attempt to eliminate the Semiprozine Hugo was defeated and committee assigned to take on the task of fixing an obviously outdated and broken definition. You can read the committee’s 2011 report, proposal and some minority reports (committee members who either disagree with the proposal or feel it doesn’t go far enough, but couldn’t get sufficient support from other members) here. As a member of the committee, I can say that this was a very difficult conversation among people with some strong opinions. In the end, this proposal represents significant improvement over the old. It draws real lines and eliminates several of the points that bothered people (for example, fanzines or prozines competing in the semiprozine category), but might introduce a few lesser evils in some people’s minds. I am very opposed to proposals in the minority reports. Two effectively suggest that we do nothing or continuing looking, when we’ve already looked at all the aspects. The minority proposal from Ben Yalow would destroy the semiprozine category. Every year, they release a list of all the publications that received more than a handful of nominations in the category. Last year, there were 20 publications on that list of Semiprozines. Ben’s proposal would eliminate 13 of them as well as many other publications not on that list. It would be devastating. I’d love to hear your thoughts. Please keep the conversation civil. If you have questions about anything, I’d be happy to answer. Editors: Charles N. Brown (editor-in-chief), Liza Groen Trombi (executive editor), Kirsten Gong-Wong (managing editor). Also, Carolyn Cushman (senior editor), Tim Pratt (senior editor), Amelia Beamer (editor), Jonathan Strahan (reviews editor), Mark Kelly (electronic editor-in-chief), Francesca Myman (assistant editor). 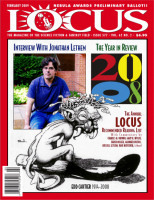 Locus Magazine, covering the SF field since 1968, is a full-size, monthly glossy-cover magazine which publishes news of science fiction, fantasy, and horror publishing; author interviews; extensive reviews; and listings of new SF books and magazines. Information provided by Charles N. Brown. The Locus Magazine Recommended Reading list is published annually in their February issue and represents a consensus view by Locus editors and reviewers. This is a website born from an ongoing attempt to abolish the Best Semiprozine Hugo. In the course of trying to eliminate the category, some disparaging remarks have been made against semiprozines. By and large, I consider their statements about the worth and health of the semiprozine field uninformed. As such, I have invited (and continue to invite) the people involved with these publications to join me in providing content for this blog. Our goal is to be both educational and informational. We’ll be featuring specific venues, providing current news, and offering some of our opinions on the state of the field as well as the Best Semiprozine Hugo. We encourage you to ask questions, suggest topics, and help spread the word.